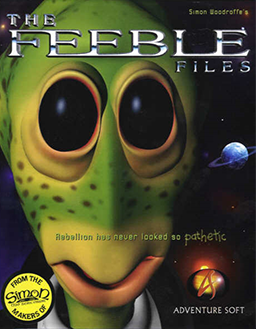 The Feeble Files was the third adventure game by Adventure Soft. It was released in 1997. While just doing his job, Feeble gets caught in a plan to overthrow the government. The Feeble Files is now supported by ScummVM, a program designed to let 2D adventure games run on multiple platforms. With ScummVM, Feeble Files now runs on modern versions of windows, as well as Linux, Mac OS X, and many consoles such as Dreamcast, Wii, PlayStation 2, and PlayStation Portable. For a complete list of platforms supported by ScummVM, see here.